Hey friend, I don’t know about you, but we are big fans of Fortnite. Why? Because it is an awesome game but it is also a great way to meet kids on their level and help them unleash their inner maker. So we put together a list of some of the best guides out there so that you and your kiddo can make your own Fortnite Items. Several of these projects are made possible with a 3D printer, for others all you will need is some craft supplies. If you don’t have a 3D printer, don’t worry, check out our video: How To 3D Print without a 3D Printer video. One of my favorite things from Fortnite is the mysterious purple cube. In the game, the cube does a lot of cool stuff. It rolls around, it shoots lightning at you when you hit it and it does other things too like recharge your shield and create low gravity fields. Well, we couldn’t quite figure out the shield regeneration and low gravity features but we did make it roll, play sound and flash light whenever you mess with it. Check it out! The electronics for the cube are made by Adafruit. The version in this video, is powered by one Adafruit trinket. Our second version, which lights up AND moves, uses two Adafruit Trinkets to control it. If you want to make your own,we have a page on Github with all the files and instructions you need. If you aren’t ready to make one, our video talks about some of the struggles with making and how you can overcome them. This idea was actually recommended to us by our friend Loudon. You may have seen him in some of our videos. Well when we started making ours, we found out that a super awesome one had already been made by The RayGun Project and he had put all the files on one of our favorite sites, Thingiverse. For this build, Bolling actually did it all by herself. Okay, maybe she had a little bit of help, but asking for help is okay. And if she can go from complete Noob, to making her own Boogie Bomb, you can too! For this project she learned how to solder, program the arduino and 3D print. Check out the video of her making the Boogie Bomb. When you are ready to make your own, you can get all the files HERE on Thingiverse. What’s is most important item in Fortnite? The pickaxe…duh. Well, our friend Andrew (the inventor of the Boogie Bomb) made this awesome flamingo picaxe. And if you want to make your own, he was nice enough to put all his files on Thingiverse for everyone to have for free. Check it out HERE. I love foam props. They are a great way to make some Fortnite items if you don’t have access to a 3D printer. This is just one example of a foam template, but there are tons of others. You can find other foam templates by searching for the specific item + template on google. Some are free. Some you will need to purchase. THIS one of our favorites. 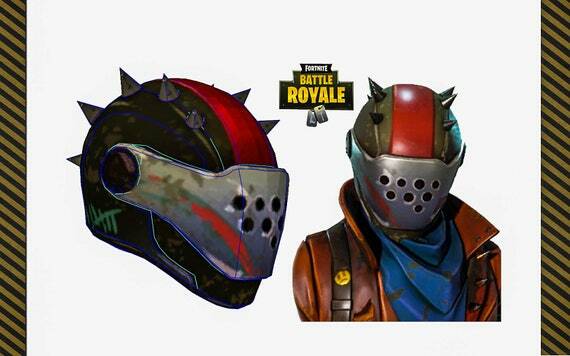 Okay okay, so this one isn’t exactly a Fortnite item, but it is cool and for some of you that are maybe a little more artsy, this one might be for you. This guy recreated Loot Lake from model clay and you can too! For those of you that are looking for something easier this one’s for you. I’m thinking I am going to have to make a couple of these for my Halloween costume this year. This kid shows just how easy it can be to make some basic items. And what’s cooler? Most of this stuff, you probably already have laying around the house. A boogie trap? 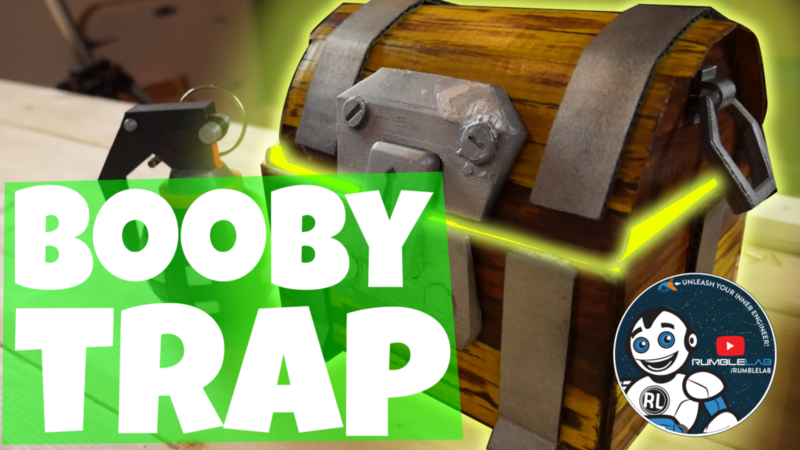 That’s not a real thing… Just imagine, your typical, irresistible Fortnite Chest but when you open it a Boogie Bomb goes off and you are hit with the uncontrollable urge to break out your favorite Fortnite dance moves. For an entire minute! We are still working on this one and are going to have a video out shortly. You can get a sneak peek of it and what it took to make it in the video. If you think this is cool, be sure to subscribe so you know when we put out the Boogie Trap video. Enough reading, go make something! For each of our videos, we try to make something cool that kids like, but we also like to have a little lesson in the video about science and engineering. We will talk about something we learned through the process, and something that we want your kiddo to learn too. If you think they would enjoy our videos, we would love for you to subscribe. That way you can watch and discuss together. I have watched your video on the boogie trap, and have found how to create the boogie bomb itself. I am wondering if there is a location that one could find how to create the chest as well. This would be a lovely piece for my living room. Thanks for reaching out! Great question and that reminds us, we need to add the link to our video. If you would like the files for the Boogie Bomb mounting brackets that we used, let us know.